I've been an avid fan of the Sherlock Holmes stories since my older brother first introduced me to them many years ago. They were probably the reason I became so fascinated with Victorian mystery writers and Victorian England in general. I devoured books by Wilke Collins, Sheridan Le Fanu, Mary Elizabeth Braddon, Charles Dickens and of course Edgar Allan Poe (even though he was not British), to mention just a few. Even now I am eager to discover a particularly well written Victorian mystery by a contemporary author such as The Meaning of Night by Michael Cox, Drood by Dan Simmons (a must for any Dickens and Collins fan) or Bellman and Black by Diane Setterfield. So when I decided to do a line of textile prints based on literary figures I chose Sherlock Holmes as the first. I had already done a portrait of Arthur Conan Doyle in which I used the smoke from his pipe as a design element. That was the starting point for this print along with his iconic Meerschaum Calabash and Churchwarden pipes. 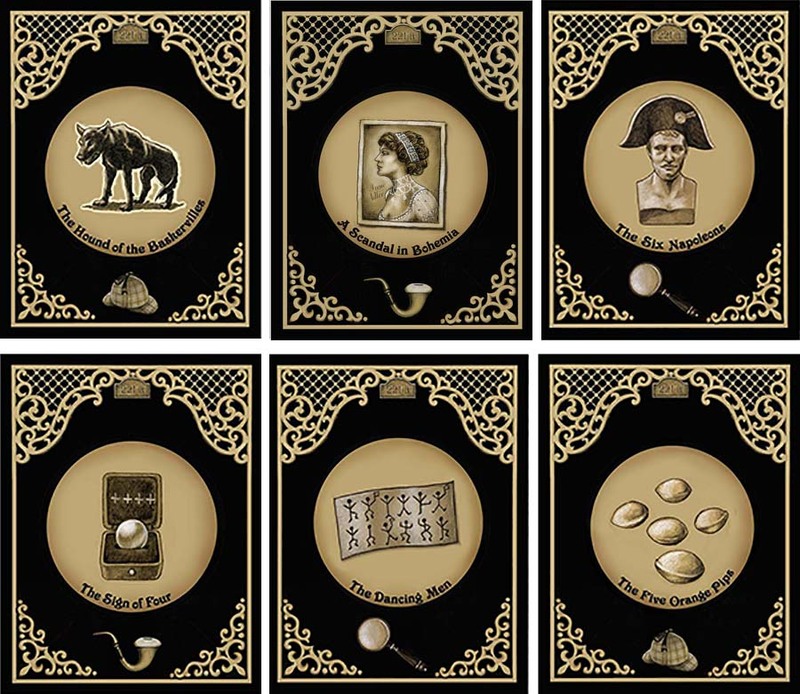 I then added in elements representing some of my favorite stories along with general items that any Sherlock Holmes fan would recognize such as his deerstalker cap, 7% solution of cocaine and the VR (Victoria Regina) made of bullet holes on his wall. The next step was to create notecards from the print, each displaying a different story and available along with the print at Curious Portraits.